One day there was a guy that come into the shop and asked dad if he could make him a wheelchair. He said somebody in the family couldn’t walk and he wanted to know if dad would be able to make him one. He explained to dad how he wanted it done; dad agreed that he would make him the wheelchair. He had to have some wheels but in them days you couldn’t find wheels already made. He thought he could make the wheels; he would need four of them. He talked to one of his friends that had a wooden lathe, dad gave him the measurements for the hubs, his friend made them, after a while dad got the hubs back, and they were 3 inches in diameter and 4 inches long so he had to make the spokes. The hub had to be divided by 10 so the spokes would be equal. He had to make 10 grooves in the hub so he could put the spokes in. He had to cut the spokes all the right length, one wheel was 14 inches in diameter and the other one was 16 inches in diameter. He had to make the rims for the wheels because he couldn’t buy that anywhere. He had to get some ash wood, 1 inch wide by 3/4″ thick to make the rim. He had to have 8 pieces of wood about 4 feet long. He had to have it a bit longer because it was hard to bend .He had to steam the wood so he could bend it round. It would take two pieces per wheel. It was hard to make them wheels; it took him a long time just to do the wheels. 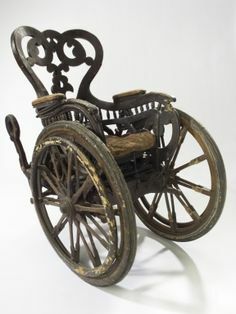 After he got the wheels done, they told dad that they didn’t need the chair anymore. Dad didn’t know what to do with them so I thought it would be nice to make a little truck wagon. I gathered some steel to make the axle. I took a piece of flat bar 29 inches long and I put the end of it in the forge fire to heat the end of the strap. I took that and put it on the anvil, took my hammer hit the end of the strap until it got half-inch round. I had to have 4 1/2 inches long to be sure it would make some thread so it would hold the wheel on the axle. I made the axle 28 inches on the outside; I wanted to make it exactly like the big truck wagon. I made the woodwork 21 inches wide inside between the wheels. I had quite a very nice wagon when I got it done.